During your stay on Corfu, do not miss out on the opportunity to visit at least one of the many Greek Churches and Monasteries. Inside you will be amazed by the stunning architecture and ceiling paintings - if not the religious significance. For Epiphany (on the 6th of Jan) we went down to the little Church at Kouloura. The local priest or 'Papas' is typically friendly. 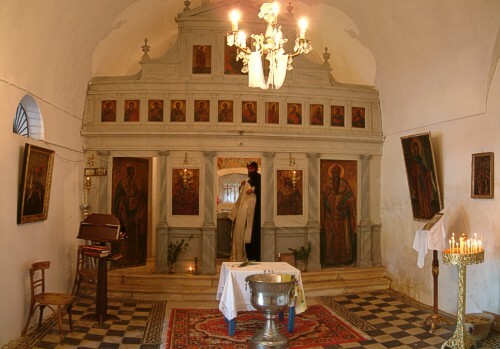 During your next visit to Kouloura, and should the church doors be open, why not take a look inside. A word of warning though. 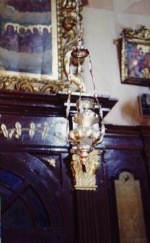 Strictly no cameras in Greek Orthodox churches and out of respect cover your shoulders and legs. I managed to take the inside photo but I had to ask for permission and only because I am a church ‘regular’ was I allowed - and if you have ever seen my 'nobly knees' then you will be glad to hear that they were covered! Anyway, after a two hour sermon the holy cross is taken outside and the priest throws it into the water three times (a long cord is attached for easy retrieval). On the third throw, the local boys dive into the harbour to retrieve it. An extra blessing is bestowed on the one who manages to find it first! Well this year it was far too cold, and only one local was brave enough to dive into the freezing Mediterranean waters to ‘claim’ the cross. Unfortunately on the first throw, the cord was snagged by Spiro's fishing nets that were abandoned by the key side. So three more attempts were made. The lone swimmer 'Maki' was waiting to dive in at the other side of the bay - he hadn't realised that the first throw was a dud! So he made his valiant 'dive' on only the second official throw. Maki emerged out of the water in his triumph, only to be told that he would have to do it again! 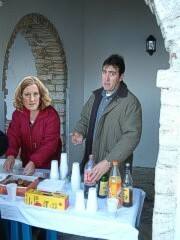 About 200 locals turned up for the event and Theo and Lynn offered drinks and cakes. Donations went towards the Church's planned restoration. Find out who created and provides this web site? Looking for an answer? Just post your question. You will be made very welcome, but out of respect make sure that you are suitably dressed. Beach attire should stay at the beach! Shorts are perfectly acceptable, but you must wear at least a t-shirt. For the girls it is essential to have shoulders covered.